High-end Android tablets are becoming few and far between, indicating to us that the tablet segment in general has been seeing a slowdown. Most consumers seem to be more gravitated to either picking up a low-cost laptop hybrid, or the many inexpensive tablets that pack reasonable value for the money. On that note, it’s no surprise to us that many companies have stopped production and development for high-end tablets on the Android side. And then there’s Samsung! If there’s one company you can count on for that, it’s no other than Samsung, because seriously, they absolutely love to get their presence everywhere. Although we’ve waited more than a year at this point, we’re seeing a successor to its popular and premium Galaxy Tab line. 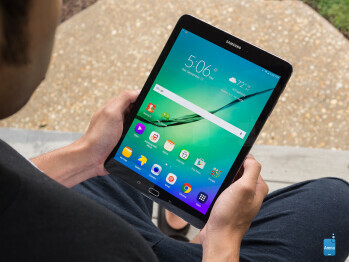 With the Samsung Galaxy Tab S2 9.7-inch, they’re ensuring that they’ll remain relevant, as this full-size offering packs a dose of premium tablet goodness in such a svelte package. It’s so lightweight and comfortable to use, you’d hardly know that you’re using a tablet. Dramatic changes have come to this new tablet, as it totally sports a new design that actually follows after the Galaxy Note 4’s design language. That’s evident in how it employs a thin metal trim accent around its edges with a matte plastic chassis, which combine together nicely to give it a more appealing design than last year’s model. We can tell that it’s been designed to compete against the iPad Air 2, just because it trims off a lot of the fat to come up being skinnier, lighter, and having a smaller overall footprint than its rival. And it helps, too, in making it comfortable to use with one hand thanks to its feather-like weight – to the point that we have no discomfort holding it for a period of time. One new, notable change is that Sammy opted to go with a portrait-style layout, as opposed to the landscape orientation of last year’s Galaxy Tab S 10.5-inch. And finally, we also find the same two dimples on its back to accommodate various covers and accessories made specifically for it. While we applaud the updated design, one that makes marked improvements over its predecessor, it doesn’t reach the same kind of premium craftsmanship we get from the iPad Air 2 – albeit, it’s surely one of the best-looking, new Android tablets around right now. Like many of Samsung’s newer products, it now features the newer fingerprint sensor, used by devices like the Galaxy S6 and Note5, so that it’s less of a hassle to operate than before. Gently resting our finger over the home button unlocks the tablet, which is considerably better than the frustrating swipe down motion that was implemented by its predecessor. Becoming a consistent practice of Samsung of late, the Tab S2 9.7-inch ditches the IR blaster altogether, indicating to us that it’s going to be a common thing going forward. That’s a shame to tell you the truth, seeing that the tablet also centers on multimedia consumption at home, so the lack of an IR blaster lessens its value by some degree – more so to those who religiously used it. Oddly, the resolution is a step below its predecessor, but it’s still a generally good looking display. 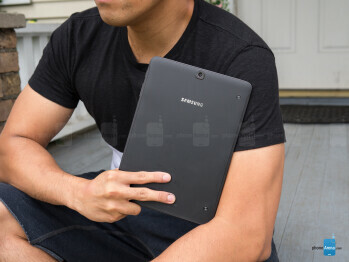 An odd gesture from Samsung, a company that’s known to always outclass its previous efforts in the specs department, they’ve decided to fashion the Galaxy Tab S2 9.7-inch with a lower resolution display. This time around, it’s flaunting a 4:3 aspect ratio with its 9.7-inch 1536 x 2048 Super AMOLED display – whereas with the Tab S 10.5, it offers a widescreen format 10.5-inch 2560 x 1600 Super AMOLED panel. Even though there’s still a great deal of detail produced by it, thanks to its 264 ppi pixel density, it’s technically still not as pixel dense than Samsung’s previous effort. There are improvements made to the screen’s quality, evident by its better ~6600K color temperature and color reproduction accuracy. Starting with the former, it betters the substantially colder ~7000K color temperature of its predecessor, which gives the screen an even more balanced tone – so it’s neither too warm nor cold. To no one’s surprise either, Sammy definitely knows how to produce an accurate screen – giving it that true-to-life representation, as opposed to the slightly saturated tones from before. Another area that takes a step back, especially for Sammy, is seen in how the screen emits a lower luminance. In this particular case, it maxes out at a meager 375 nits, which poses trouble when it’s used outdoors with the sun’s presence glaring down on it. 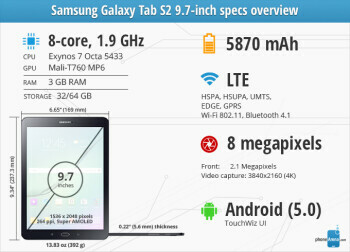 By comparison, the Galaxy Tab S 10.5 fared a bit better at 395 nits. While it's a fact that the screen is a step backwards from its predecessor in certain areas, it’s still a pretty good looking panel! There’s enough iridescence, wide viewing angles, and brilliance to make it a compelling visual treat to the eyes. Great for everyday use, the TouchWiz experience caters well to the tablet size, but it lacks the breadth of features found with the Note5’s paper & pen experience. So, what can we say about its experience? Nothing really new, that’s for sure, seeing that it’s running the same updated TouchWiz UI used by many of Sammy’s smartphones – though, it’s on a grander scale to fit the larger size of its screen. Running on top of Android 5.1.1 Lollipop, we will note, however, that there’s support for multi-users, which makes it home-friendly to accommodate multiple users with their own settings and content. Besides that, there’s nothing new here that we haven’t seen before. Continuing to employ the same trimmed down TouchWiz we’ve been seeing since its introduction earlier this year with the Galaxy S6, the experience favors simplicity above everything else. Staple TouchWiz features are found here, such as Multi-Window for true side-by-side app multitasking, pop-up-view that shrinks certain apps to a more thumb-reaching friendly size, and the wealth of S-branded apps from Samsung. Being a tablet, it sees some added features that we don’t get exposed to with a smartphone. Firstly, SideSync has been updated to offer auto-connection and file transferring to our connected smartphone. It works pretty well for the most part, but its main benefit is to allow us access to our smartphone through the Galaxy Tab S2. There’s also an improved reading mode that subdues the tone of the display, ensuring that our eyes don’t strain when reading in the dark. And solidifying its package, it comes preloaded out of the box with the entire Microsoft Office suite of apps – so that includes Word, PowerPoint, Excel, and OneNote. 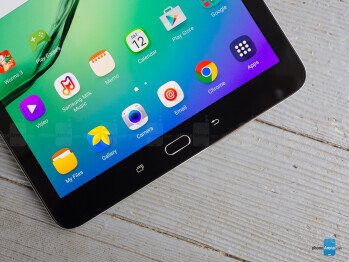 Indeed, TouchWiz on the Galaxy Tab S2 9.7-inch continues to be a powerful experience, but it doesn’t rival the higher degree of functionality we get from the Note5’s particular experience. Of course, the addition of an S Pen would greatly benefit and deepen its package, but we suppose that might come later on in some other tablet from Samsung. For everyday use, we can’t argue its usefulness. Although it’s not the latest piece of silicone from Samsung, the older Exynos 5433 chip still delivers a zippy performance. You would think that Samsung would leverage its latest Exynos chipset to power its finest tablet, but that’s not really the case. Instead, it’s armed with the same firepower found in the Note 4 – an octa-core Exynos 5433 SoC accompanied with 3GB of RAM and the Mali-T760 GPU. Deciding on using this particular setup makes the Tab S2 rather underwhelming in contrast to the other models in its portfolio, but despite that, the performance is pretty responsive. Trivial stuff such as opening apps and navigating through the interface are all handled in a pleasant manner, while multi-tasking via its Multi-Window feature is equally zippy. Solidifying its processing punch, it earns some pretty good marks in various processing benchmarks. Still, the results aren’t Galaxy S6 or Note5-like. Over on the graphics processing side, it performs reasonably well with its consistent frame rates – though again, not quite as buttery as the S6 or Note5. 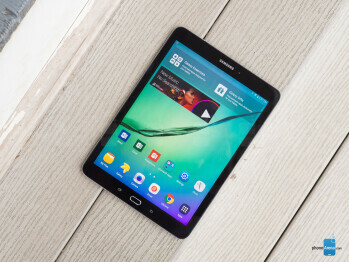 Call it a refreshing change of pace, the Galaxy Tab S2 9.7-inch features a microSD card slot, which is something that we don’t get in Samsung's other new devices. 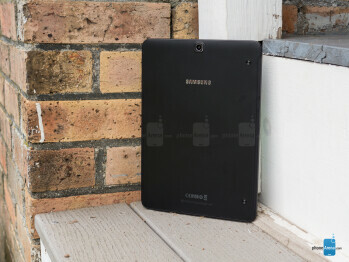 It complements the 32GB and 64GB storage variants that the tablet is available in. What’s there not to like about the web surfing experience here, especially on a high-spec’d tablet? None honestly, mainly because it hits the high points in all the areas we care about most. In particular, we have speedy page loads, quick handling of page rendering on the fly, and we can’t forget about its oh-so smooth navigational controls. Launching first as a Wi-Fi only model, the Tab S2 9.7-inch will eventually come with LTE-connectivity for a truly untethered experience. Rounding out its connectivity set, it features aGPS with Glonass, Bluetooth 4.1, and dual-band 802.11 a/b/g/n Wi-Fi. Strangely absent though is NFC, which is a disappointment on its own considering this is an otherwise, high-spec’d thing. It takes some good shots for a tablet, but it’s definitely not as on-point and sharp like the S6 and Note5. Over on the camera side, it doesn’t look like Sammy changed anything about the camera combination here with the Tab S2 9.7-inch – so that’s an 8-megapixel rear camera and a front-facing 2.1-megapixel one. However, the rear camera has been paired with a new, wider f/1.9 aperture lens, which should give it an advantage under low light over its predecessor. 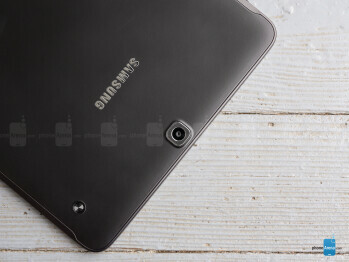 For a tablet, the cameras seem well within the threshold we’d expect. Peeking into its camera interface, it’s the same exact one we’re familiar using in Sammy’s other smartphones. Combining a solid set of shooting modes and a handy Pro one as well, the experience can be enhanced by downloading additional modes through the Galaxy Apps portal. With its Pro mode, however, we don’t have access to adjusting the focus or shutter speed, which is kind of strange and limits the control options. The results, naturally, are quite inviting for a tablet – so yeah, you can go ahead and use it to capture some memories. While the quality is good for a tablet, it’s not on the same level as the Galaxy S6 or Note5, but regardless of that, there are enough favorable results when lighting is sufficient. There’s enough emphasis on fine details, which are marked by its slightly cooler color reproduction. And while it seems to have difficulty with dynamic range on the automatic setting, the HDR mode works well in offering an equal exposure throughout the shot. Low-light scenes aren't really handled that well. They mostly come with decidedly smudgy and dull details, along with abundant levels of noise. When there’s strong lighting in an indoor scene, it manages to pull out slightly better results, but overall, this camera won't be your best pick for low-light photos. Presented with four options for shooting video (QHD, FHD, HD, and VGA), its optical image stabilization only becomes available with 720p and 1080p recording. 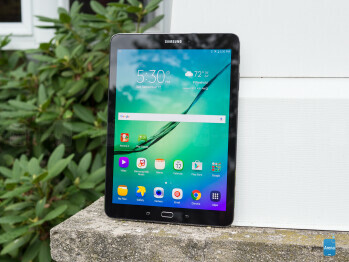 Still, the Galaxy Tab S2 9.7-inch takes some decent looking videos – for a tablet, obviously. While colors are mostly convincing, details are noticeably lacking, resulting in a somewhat unclear image quality. Its focus adjustments run smoothly and quickly, while audio recording is clean and noise-free. It’s nice to find dual front-firing speakers, but it’s disappointing that it’s flatter with its tone. The TouchWiz music player is, well, all expected with nothing different about its functionality and presentation, especially for a tablet. By and large, it’s looking a bit on the stale side in comparison to the other, spiffier looking music players out there. At least we’re given some manual controls to adjust the equalizer enhancements using SoundAlive, and that’s in addition to the preset ones we’re given. There are actually two speakers here in the Tab S2 9.7-inch, with both of them placed along its bottom edge. Even though it’s able to pump out a stronger 74.4 dB output, versus the weaker 71.9 dB of its predecessor, the overall quality is still underpowered in tone – to the point that it can even sound quaint in small areas. You’d think that adjusting its SoundAlive settings would deliver more robustness with its quality, but it hardly does anything to back it up with more substance. Quite frankly, it sounds dull and light. Thankfully, though, the video watching experience is more likeable due to its Super AMOLED screen, which can deliver even better visuals for the occasion when it’s placed into adaptive mode. In fact, the contrast and color saturation are all adjusted automatically to produce the most ideal viewing experience – and it certainly catches our eyes, as videos come to life on it. Best of all, the same multi-tasking element is in play here with the ability to “pop-up” a video and have it run on top of whatever we’re doing. The tablet’s gallery app also follows in the same fashion as Sammy’s smartphones. Arranging photos and videos in either a timeline or album view, we’re given enough photo editing tools to appreciate doing some light editing on the road. Now, the love doesn’t end there because there’s also a native video editing feature as well! Battery life seems to be way behind the pack in the tablet space. Coming in with an even more condense package than before, the compromise in giving the Galaxy Tab S 9.7-inch its svelte construction and minimized footprint is seen in the reduction in size of its battery. From the hefty 7900 mAh juicer in last year’s Tab S 10.5, it’s been shrunken down to an even smaller 5879 mAh battery cell for the Galaxy Tab S2 9.7-inch. Yes, it’s able to achieve more than a solid-one day of usage in our real-world, everyday experience. Despite that palpable reach, it fails way short against its predecessor and rivals in our custom battery benchmark test – to the degree of 6 hours and 46 minutes. That’s even shorter than the times we get out of most high-end smartphones, so it’s rather unimpressive. Certainly, its 263 minutes of charging time might seem excessive when compared to some of the rapid-charging phones we’ve been exposed to of late, but it’s actually an improvement over the Tab S 10.5-inch – and it’s even faster than some other tablets out there. Well, it’s worth noting that the charging time was achieved using one of Samsung’s rapid charging wall adapters. However, it comes out of the box with a standard one. In the back of our minds, though, we can’t help but think that this is, in a way, a step backwards for Samsung. No doubt, it exudes and embodies the characteristics of high-end tablet, but there are a few features removed from this that were found with last year’s offering in the Galaxy Tab S 10.5-inch. With this, we don’t get an IR blaster, and its battery life has been weakened – all of them are revelations that we find alarming. Thinking about it in that way, it makes us believe that there’s still more value found with its predecessor, especially when it can be fetched for far less now. While it certainly meets that expectation of being a fun tablet that can be used for an assortment of occasions, it still lacks the productivity specific set of functions that give the Surface 3 more of an advantage to power users. We know that Microsoft’s Office suite is preloaded here, but Android as a whole still has some limitations to it that prevents it from competing in the same scope as a Windows 10 powered tablet. Buy this for the design and svelte construction. 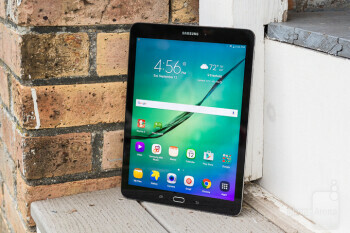 If not, it might be worth a shot picking up the Galaxy Tab S 10.5-inch instead – that’s just as long as you can tolerate its less-than-appealing design.